Dynabrade Inc., world leader in the design and manufacture of unique abrasive power tools, is honored to showcase a product grouping designated for the marine industry and aftermarket. 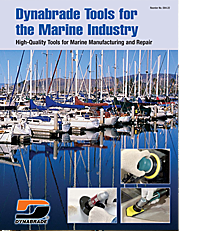 In this catalog are high-quality Dynabrade tools that offer countless application solutions for marine manufacturers and repair facilities. Review our incredible array of Random Orbital Sanders, Disc Sanders, Cut-Off Tools, Buffers and more. 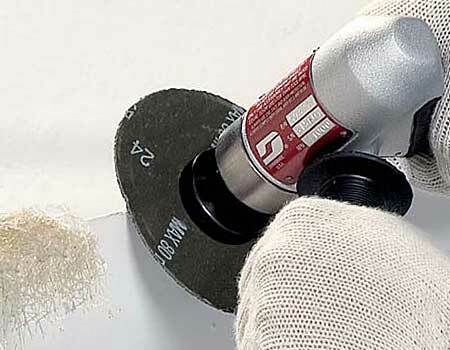 Whether you are trimming thick excess fiberglass or removing a tiny dust nib, Dynabrade has the right tool for the job. At every workstation in your facility, there is a need for the efficiency and excellence of Dynabrade. 58041 Gear-Driven Sander offers massive 11" (279 mm) diameter work area, perfect for "fairing" and sanding on molds or plugs. Covers more area in less time, easily leveling large surfaces prior to achieving mirror finish. 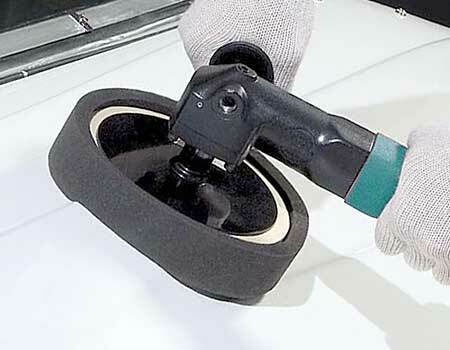 58485 11" (279 mm) diameter Random Orbital Sander is also available. 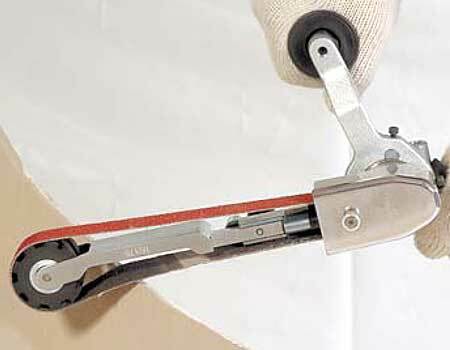 50321 Pistol-Grip Disc Sander easily removes excess fiberglass. This tool is also used for scuff sanding on the boat's resin surface, preparing it for proper adhesion of buoyancy foam. 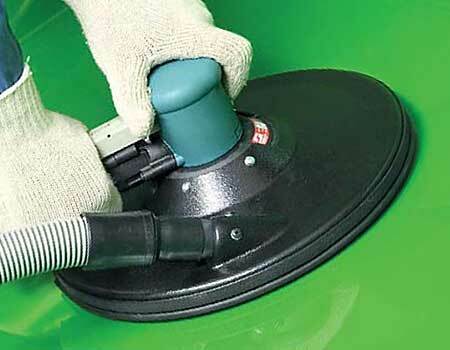 52438 Vacuum Diamond Cut-Off Wheel Tool powers 5" (127 mm) diameter diamond cut-off wheels (sold separately), to aggressively cut through thick fiberglass over-wrap and fiber spray. Unique vacuum guard diverts dust and debris to optional vacuum source. 53143 Right Angle Drill serves up the power (1 hp / 746 W) to run optional diamond hole saws, for quick punch-out of holes on dashboard templates, and for creating other openings. 15300 Dynafile® III abrasive belt tool is run with 15375 Contact Arm, which allows finishing and polishing with the slack of the belt. Ideal for use on rough edges of trimmed pieces. The tool also accepts a wide range of additional contact arms, to suit many other applications. 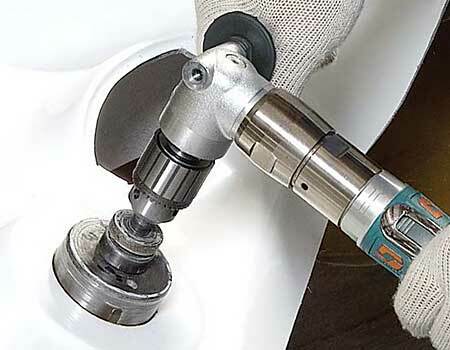 The 59039 Dynabrade Dynorbital-Spirit™ Random Orbital Sander moves an abrasive disc in a small orbit of 3/32" (2 mm). This is ideal for patch repair on gel coat and clear coat, as the tight sanding pattern leaves a finish that can be perfectly buffed in just one more step. Dynorbital-Spirit™ is also great for removing "print-through" patterns in fiberglass. Dynabrade durability means the Dynorbital-Spirit™ will last longer than other brands, and when repair is needed, our unique "Drop-In Motor" puts the tool back to work in minutes. 58000 Dynafine™ Sander features 1/32" (0.8 mm) diameter orbital action for achieving a superior finish. Lightweight tool of only 1.6 lbs. Low profile housing allows easy access in hard-to-reach areas. 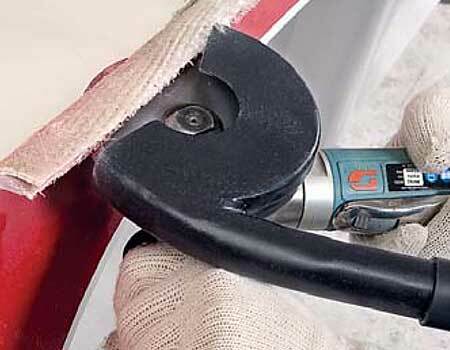 Handle is offset 7 Degree for greater operator comfort and control. Utilized for finesse sanding, gel coat touch-up and general spot repair – a useful tool for every marine facility. 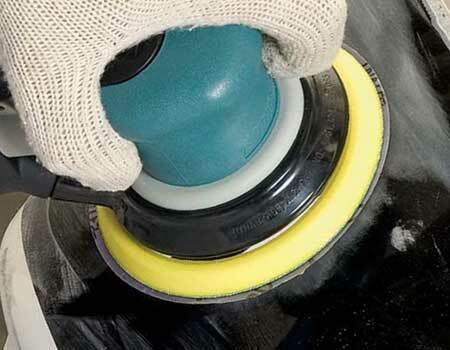 51459 Dynabrade Buffer is utilized for effective buffing and final finishing. 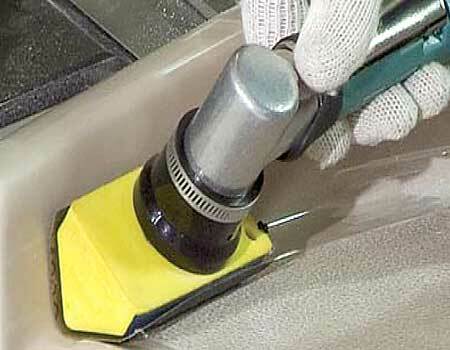 Running at the optimum speed of 2,500 RPM means this buffer is actually polishing out scratches - Not melting them into the surface, as faster buffers often do. Run our slow-speed, high torque buffer with a foam or wool buff (sold separately) for a quick and efficient finishing system.